The front-running candidates to replace Gov. Chris Christie say they have solutions to cure the train pain suffered by New Jersey commuters this summer. Lt. Gov. Kim Guadagno, the Republican candidate, said she would seek to audit New Jersey Transit and other transportation agencies to find cash and resources that should be dedicated to making the trains run on time. She also favors requiring transportation employees to re-apply for their jobs if labor contracts permit. Phil Murphy, the Democrat, questioned how effective such an audit would be – especially since Guadagno and Christie have already had years to find efficiencies in Trenton and appoint key transportation personnel. Murphy, a former U.S. Ambassador to Germany and investment banker, told the I-Team he would consider new taxes dedicated to mass transit in order to stabilize crumbling rail infrastructure. But he also suggested the working class should be shielded from any new taxes. "You’ve got to look at every available alternative. Everything’s got to be on the table,” Murphy said. “But you have to abide by a tax fairness principle and the middle class has been hollowed out and beaten up." When asked if she would consider a tax dedicated to funding trains, Guadagno bristled at the idea. Though the pair of gubernatorial hopefuls differ on many transit related issues, one area of agreement is the idea of selling development rights for land adjacent to train stations. 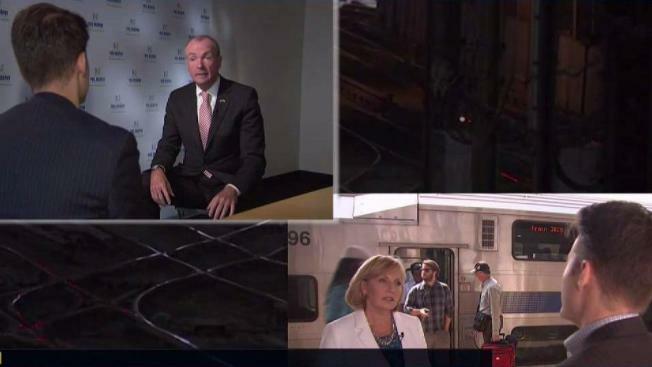 Both Guadagno and Murphy told the I-Team they believe needed revenue could be raised by building residential buildings and retail storefronts clustered around NJ Transit stations. Murphy suggested NJ Transit could find much-needed cash by selling rights to build residential and retail development on its parking lots. “A lot of the reason the development is held back is for parking spaces,” Murphy said. Murphy and Guadagno also share support for the Gateway Project train tunnel under the Hudson River. The new tunnel would ease congestion for interstate and commuter trains crossing from New Jersey into New York’s Penn Station. When asked whether Christie made a mistake in blocking the ARC tunnel project in 2010, Murphy said yes. Guadagno said she’s not sure whether she would have made the same decision Christie did.